Using a rotisserie on a Weber gas grill is pretty much the same as on a Weber kettle. 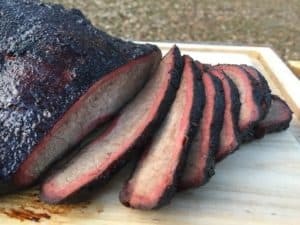 You want to use indirect heat and a drip pan is an excellent idea. You will also have to remove the grill grates so the roast, turkey, etc can properly turn. It is better to figure this out before you preheat the grill. There are two Weber Genesis rotisseries available but they are not interchangeable between the different Genesis grills (different lengths). If you have a new Weber Genesis (E/S 300, 310, 320 or 330) then the rotisserie you need is the Weber 7519. 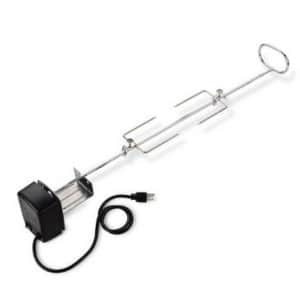 This rotisserie has a metal handle, no counterbalance and has a water-proof housing for the motor. The Weber 7519 has been out of stock for several months. This model is a perfect substitute. If you have an older Weber Genesis (Silver, Gold, Platinum, 1000-5000) then the official Weber rotisserie is no longer available. An aftermarket equivalent is sold by OneGrill and can be bought here. If you already own the Weber kettle rotisserie you do NOT need to buy an entire rotisserie kit for your Genesis. You already have a motor, mounting bracket and forks. All you need is the right length spit. I called Weber Customer Service (1-800-446-1071) and told them what I was doing. They sold me the correct spit for $20 (plus $7 shipping). You might also stumble across a few “Universal” rotisserie kits out there like the GrillPro 60090. Buy these at your own risk. Most of these Universal rotisseries kits are only rated for 6-10 pounds and look like they would barely last a season. There are three Weber Spirit rotisseries and the right one depends upon when your Spirit grill was made. If you have an older Spirit such as the 500 or 700 then the rotisserie you need is the Weber 7517. This is the same rotisserie that fits the older Genesis grills (1000-5000, Silver, Gold and Platinum). The official Weber rotisserie is no longer available. An aftermarket equivalent is sold by OneGrill and can be bought here. There is a rotisserie for the Summit 400 series (Weber 7570 ) and one for the Summit 600 series (Weber 7571 ). Both of these rotisseries come with four forks which makes spinning two chickens pretty easy. These rotisseries have metal handles so you will need some oven mitts to take the hot spit off your grill. The biggest difference in rotisserie cooking on the Summit grills concerns the burners. The Summit 470 and 670 grills have a dedicated rear mounted infrared rotisserie burner while the Summit 420 and 620 do not. How you set your burners, etc will be different depending upon which Summit grill you are working with. Learn How to Use Your Rotisserie With The Weber Rotisserie Guide!